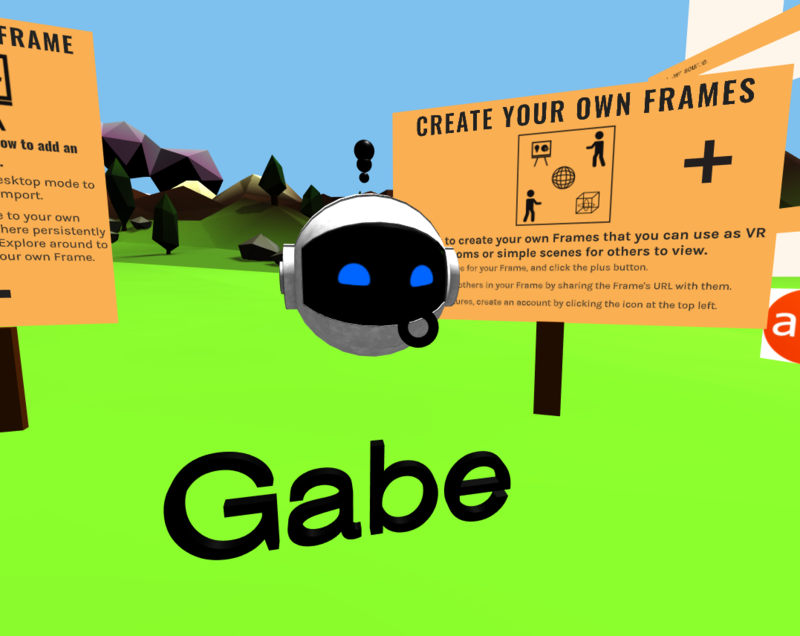 rame is a browser-based tool for simple, immersive creation and, if you want, real-time communication and collaboration in VR. It works on desktop, mobile, and most VR headsets (even Cardboard!). We released Frame about a month ago and we're really thrilled to see people willing to try it out, especially given that it's in this early alpha stage. We're grateful for your feedback. We've got some updates that we're excited to share with you, and although a lot of the work was behind the scenes (ie bug fixes galore), there are some fun new features worth checking out. We wanted to have an easy way to show off Frames that people can easily find and view, helping them see the possibilities of what can be done with Frame. It's really early days for the Gallery, but we'll be adding more content to it over the next few weeks and also soliciting user-generated content from those that are already creating stuff with Frame. I'll be writing a separate post dedicated to the gallery. You can check out the gallery at: learn.framevr.io/gallery. Some early highlights include a Frame with a gorgeous 3D model of a Bagan Temple (you can read about how this was done here), a Frame that helps you learn about all the stuff you can bring into your Frame (view here), and one with a nice photosphere we found on Flicker. The new "home" world of Frame has gotten a redesign. It's now a simple environment in the "low poly" style. Our artist managed to get this 3D model down to about 1MB, so beyond looking better, Frame also loads faster now. You can get a peek at the environment in the GIF at the to of this post. We'll be improving this environment over the next few weeks, adding lighting, shadows, and structures. We know that some of our users are only interested in using Frame to create and share simple WebVR scenes, and they aren't necessarily interested in the collaborative, multi-user functionality. Now, when you claim a Frame and open its settings, you'll see an option that will let you toggle whether a Frame is "multi-user" or not. If a Frame is multiuser, then when multiple people go to its URL at the same time, they can interact as avatars for real-time communication and collaboration. If a Frame is not multi-user, then visitors to that Frame always be in there alone and will always be exploring it on their own. You can find the toggle when you're logged in to the Frame sidebar which you can access with the orange button on the top right of any Frame. Send any questions about the Frame alpha to hello@framevr.io and we'll get back to you ASAP. Bringing an ancient Buddhist temple into social VR for shared exploration.